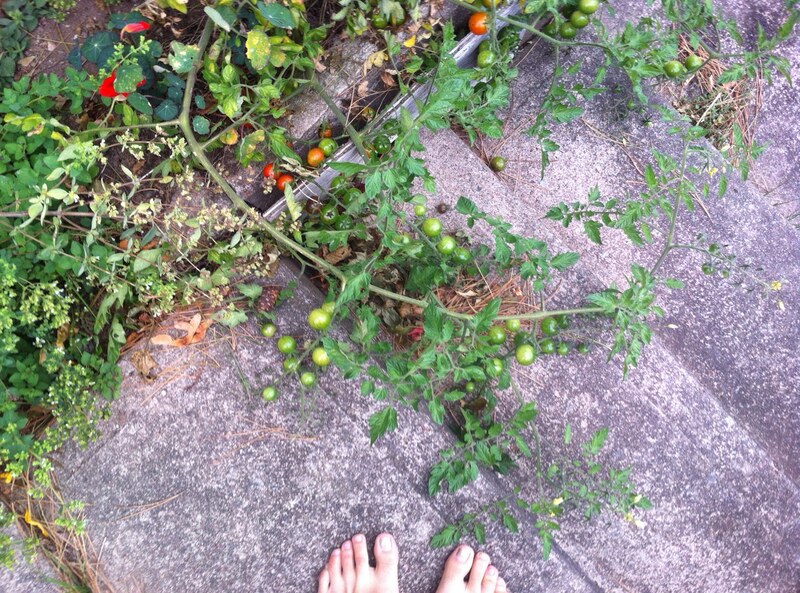 This year, I didn’t grow tomatoes on purpose in this bed. But a seed from last year’s plant grew anyway. My mom calls that a “volunteer.” As you can see, I just let it “do it’s thing,” I didn’t put a cage around it or anything. And do it’s thing, it did: it grew and grew and grew, sprawling over the concrete steps at the back of the house. 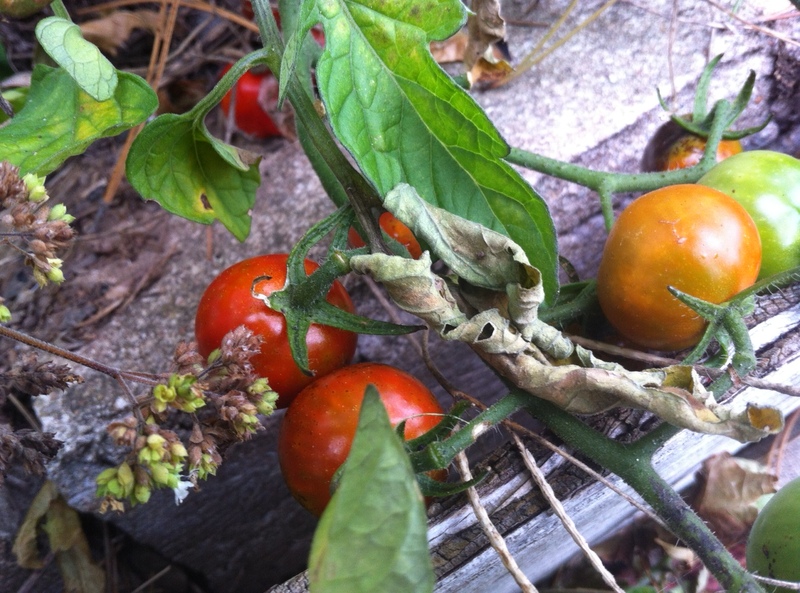 I was in my garden yesterday (despite attempting to be lazy all Sunday, I just couldn’t help myself, and had to go out and poke around in the dirt a bit), and I looked at my volunteer tomato, and I thought about the metaphor it brought me, along with the fruit. And that is, that sometimes the things you didn’t plan for, come along in your garden bed anyway. Be grateful for them. Eat the tomatoes, and smile that you have them, even though you didn’t think you would. For the ways of seeds, both literal and figurative, are mysterious and beautiful, and life is good. This entry was posted in Day to Day Life, Food + agriculture, Leah's thoughts, Outdoors and tagged gardening, Slowing down life. Bookmark the permalink. What a great post! You made my day! Thanks so much, Margo! 🙂 I love hearing that. thats awesome, I had blackberries growing in my untended garden this year, I never planted tham before and have no idea how they got there, but they were yummy.